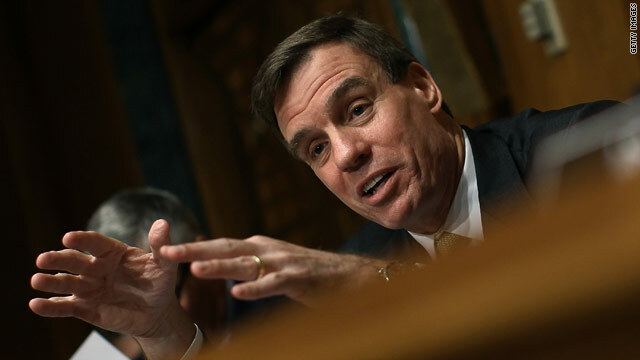 Washington (CNN)– Virginia Democratic Senator Mark Warner may not be on the bipartisan Congressional super committee, but he's pushing it to "go big," and hosting a dinner Wednesday evening for political heavyweights at his home outside Washington to talk about how both sides can come together to solve the nation's debt crisis. Warner is well aware of the obstacles that face the twelve House and Senate members on the Super Committee. He's a former member of the "Gang of Six" in the Senate that developed its own deficit reduction plan this summer that failed to gain traction. Two members of the "super committee" are expected to be in attendance at the dinner, according to sources familiar with the event. Maya MacGuineas, the President of the Committee for a Responsible Federal Budget, who is organizing the off-the-record dinner, as well as a series of afternoon panels on Capitol Hill earlier Wednesday afternoon, said this is an effort to help provide support for the super committee that is tasked with reigning in out of control federal spending with only a matter of weeks before it needs to agreed on a plan. "We want to create the momentum for them to do something and provide cover so they can make the hard choices," MacGuineas told CNN by phone on Wednesday. MacGuineas' group and leaders from the Concord Coalition and the Bipartisan Policy Center put together a line of budget experts to push the message the Super committee needs to "go big" and come up with more than $4 trillion in deficit reduction. Panels covering the politics and the possible path ahead for the twelve member Congressional committee feature the heads of previous fiscal commissions like Erskine Bowles, former Senator Pete Domenici, as well as former House Budget Chairmen John Spratt and Jim Nussle, and former Federal Reserve Chairman Alan Greenspan. Warner and Senator Mike Crapo, another member of the "Gang of Six" will also participate. After the event on Capitol Hill, Warner invited 60 people to his home, including some of those at the forum, plus about 15 CEOs, House and Senate members from both parties, and other budget experts who want to influence the panel's plan. Virtually every day there is some directive from top leaders from President Obama to the House Speaker John Boehner, as well as outside interest groups, telling the Super Committee it needs to exceed its target of cutting $1.5 trillion over the next 10 years. But the pressure from political leaders and business groups also includes big caveats about keeping tax increases or entitlement reforms off the table. But by pulling together people with experience dealing with weighty budget issues, the effort on Wednesday –both on the Hill, and at Warner's home – is aimed at demonstrating that a "big" proposal can get support to pass. "We're trying to create a groundswell of putting the public interest in front of the special interest," MacGuineas said. Because of the intense interest from business leaders who want to attend it's likely the dinner will be the first of several get-togethers designed to keep the pressure on the super committee to aim high with the proposal it is now developing. The Super Committee is scheduled to meet and hold a hearing on Thursday, and its recommendations are due to be released around Thanksgiving. Is it against the rules for the super committee to delegate responsibilities to people or subcommittees of their choosing? $1.5T in a few weeks is a LOT of money to count. Warner has been a great Governor and Senator for Virginia. History shows Virginia has always done best under a Democratic/Progressive Governorship. We survived Allen and Gillmore who almost destroyed our states economies while pushing forward their radical religious and ideological agendas that took away freedoms and rights while supporting tax shelters for parasites like Jerry Falwell, Pat Robertson, Dobeson, etc. @NVa – You are so right about Warner – One of the best of VA since I've been down here. I trust he will do the right thing in the Senate and they should follow his advice!!! This is a long way from the "Clean Increase" that Obama originally demanded regarding the debt ceiling. Thanks to Speaker Boehner we are seeing this work being done, and if they are able to identify a plan to reduce federal spending by trillions of dollars over the next decade, the American taxpayer is finally getting some consideration.